Situated on the Shivalik foothills in village Bilaspur of the Panchkula district. 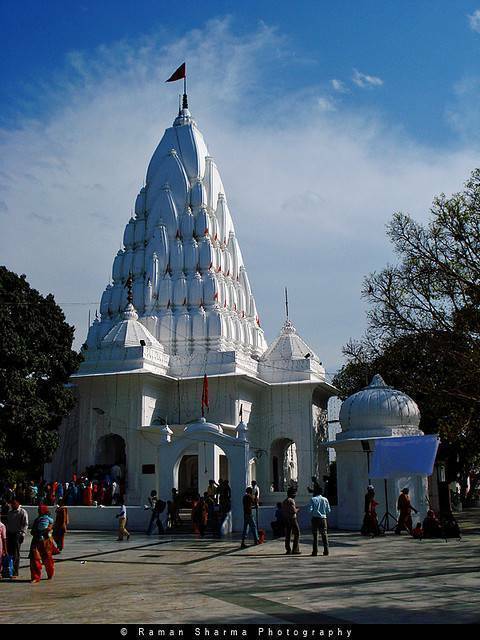 Mata Mansa Devi Mandir was constructed by Maharaja Gopal Singh of Manimajra between 1811-1815 AD. The temple complex houses another temple as well. This temple, located 200 meters away, called the Patiala Temple, was built by the Maharaja of Patiala in 1840 to commemorate his victory in the battle against the Gurkhas. The temple complex is spread across 100 acres (0.40 sq. km.) and is one of the most prominent Shakti temples of North India. The temple contains thirty-eight panels of wall paintings besides floral designs painted all over the ceiling and the arches leading into the temple. Hundreds of devotees throng the shrine from various parts of the country every day. This number rises manifolds during the Navratra mela that lasts for nine days twice every year. Langar is provided to the devotees at the Langar Bhawan in the temple premises at all times. There are a few guest houses outside and a small market for visitors to shop and buy souvenirs. All in all, a visit to the Mansa Devi temple is a sacred experience and enlightens the body and soul.